Phil Yeager was named Chief Commercial Officer overseeing Intermodal and Truck Brokerage operations as well as sales, pricing, solutions and account management in January 2018. Phil formerly held the role of Executive Vice President, Account Management and Intermodal Operations since 2016 after serving as Vice President of Account Management and Business Development since 2014. Phil joined Hub Group in 2011 as the Director of Strategy and Acquisitions and led the integration of Mode Transportation. 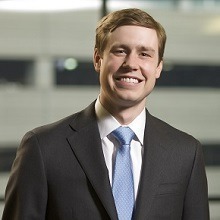 Prior to joining Hub Group, Phil served as Assistant Vice President of Commercial Banking at BMO Harris Bank, and as an investment banking analyst for Lazard Freres & Co. In addition to his responsibilities at Hub Group, Phil also serves on the boards of the University of Denver’s Transportation Institute, the Northwestern University Transportation Center Business Advisory Council and Ann & Robert H. Lurie Children’s Hospital-Chicago. Phil earned his Bachelor of Arts degree from Trinity College in Hartford, Connecticut, and a Master of Business Administration from the University of Chicago Booth School of Business. Phil and his wife, Margaret, reside in Hinsdale, Illinois with their daughter Charlotte.